eVidyaloka improves the quality in education by connecting high quality teachers across the world through live, interactive online classes for the children via the Digital Classrooms setup in the village Government schools. 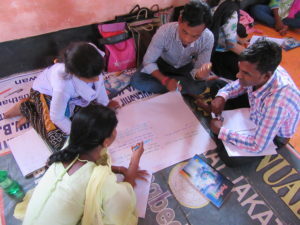 CESR started the programme in four government aided junior high schools, viz., Dumdumi M.S.K, Chargali Jr. High School, Podlara Jr. High School, Jabarrah Jr. High School and Rudra Jr. High School in Purulia district. CESR is working closely with the school administration and is the local sponsor of the project, supporting the activities like availability and safety of children, physical infrastructure upkeep, local utilities like Electricity, Water and Internet maintenance and any other local logistics support required for the project. eVidyaloka is responsible for all the Remote management activities ranging from sourcing and managing the teachers, class schedules, content management, operations governance, evaluations, managing feedbacks etc.